While I'm on the subject of Mad Magazine, I might as well… I might as well mention that then I… I did a project in my senior year, which was submitted to the Wisconsin Academy of Sciences, and which I… well, no, first to the Westinghouse Science Talent Search, which is… which is now called the Intel Science Talent Search or something, but it's a nationwide competition… and it was… it was called The Potrzebie System of Weights and Measures. This is a Polish word that was very popular in Mad Magazine, and I decided to base a system of weights and measures that was going to be better than the metric system. It was based on the thickness of Mad Magazine number 26, or something like this, and that was taken as one potrzebie of length. And then we had, you know, a kilo potrzebie was a thousand of those, and a… and a fershlugginer potrzebie was a million… and a farshimmelt potrzebie was one millionth. We had units of time, weight, everything, in the system, and it won honorable mention in this Science Talent Search, and also was… was… I did some demos at the Academy of Sciences; it won an award in Wisconsin. I submitted it then to Mad Magazine, and they published it; they paid me $25 for it, and it came out in… during the spring of my freshman year in college. And this was my first technical publication, so it is listed on my vita, you know, and publication number one is the Potrzebie System of Weights and Measures, and it was published later in paperback in one of the Mad reprints, and it… it… and I used it as a basis of running for student government at… in college. And it failed miserably, I didn’t… you know, I didn't get elected. I also sent a sequel to Mad, which was a crossword puzzle. One of their – the Alfred E Newman figure – is one of the… was featured on lots of their articles, and this… this silly boy's face with the… with the missing tooth… and when I looked at his teeth, I could see, you know, white squares and black squares, reminding me of a crossword puzzle. So I added more white squares and black squares up in his forehead area, and where his hair is, and I filled… and I made that into a crossword puzzle with… with Mad type clues, like, you know… blank me worry, or something like this, and I… and I submitted that, and they rejected that, you know, they didn't want… but I've still got it. And later on when we… when we get to writing… I'm hoping that I'll someday publish a book called Selected Papers on Fun and Games. We will not only reprint my… my first technical article on the Potrzebie System, but also the one that was rejected by Mad, and we will see the… and people will decide whether they… you know, will be able to decide now whether they made the right decision in rejecting it. So yeah, I like to see things, sort of, out of the box as well as in the box. 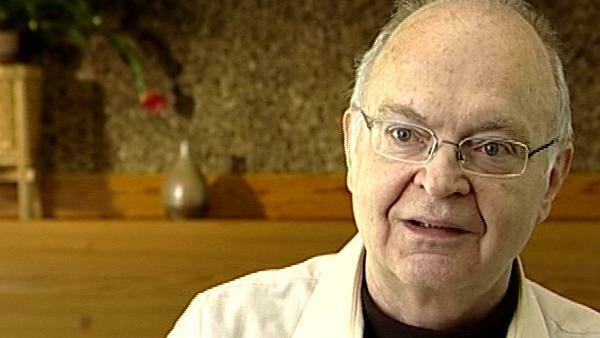 Born in 1938, American computing pioneer Donald Knuth is known for his greatly influential multi-volume work, 'The Art of Computer Programming', his novel 'Surreal Numbers', his invention of TeX and METAFONT electronic publishing tools and his quirky sense of humor. Title: "The Potrzebie System of Weights and Measures"
Trained as a journalist, Dikran Karagueuzian is the director of CSLI Publications, publisher of seven books by Donald Knuth. He has known Knuth since the late seventies when Knuth was developing TeX and Metafont, the typesetting and type designing computer programs, respectively.